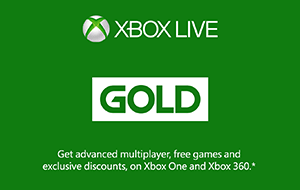 With Xbox Live Gold, you get the most advanced multiplayer, free games, exclusive member discounts and more. Play games like Titanfall™ and Halo with your friends on a network powered by over 300,000 servers for maximum performance. Cloudhosted multiplayer helps eliminate lag and cheating. Your membership includes a growing library of free games, and discounts up to 50-75% on games in the Xbox Store. And on Xbox One, it’s even better, with smarter, faster matchmaking, and online multiplayer for everyone in your home.